When you choose a church, gudwara, or ethical society to attend with your partner or family, how do you find one? Word of mouth? The internet? And how do you know you’re welcome? As digital spaces have become more robust and hospitable, and as many of us are finding valuable relationships in online and non-traditional communities, many religious institutions find themselves at a crossroads. 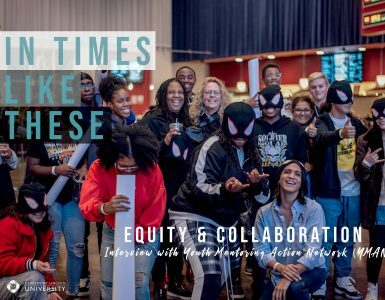 How can they share positive messages about community and transformation without losing on-ground traditional values and methods that many hold dear? 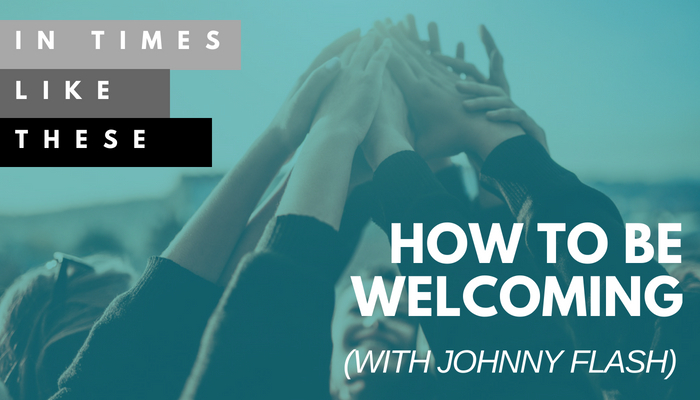 In this episode of In Times Like These, we talk with John Falke, also known as Johnny Flash about how to be welcoming. John is the creator of Amplified Impact, a blog, podcast, and organization that helps religious communities and organizations amplify their work to extend their message and purpose. Announcer(steph: You’re listening to In Times Like These, a production of CLU Live at Claremont Lincoln University. In Times Like These explores the difficult spaces we humans navigate in culture and religion, in dialogue and doubt. When you choose a church, gurdwara, or ethical society to attend with your partner or family, how do you find one? Word of mouth? The Internet? And how do you know you’re welcome? As digital spaces have become more robust and hospitable, and as many of us are finding value relationships in online and nontraditional communities, many religious institutions find themselves at a crossroads. How can they share positive messages about community and transformation without losing on-ground traditional values and methods that many hold dear. 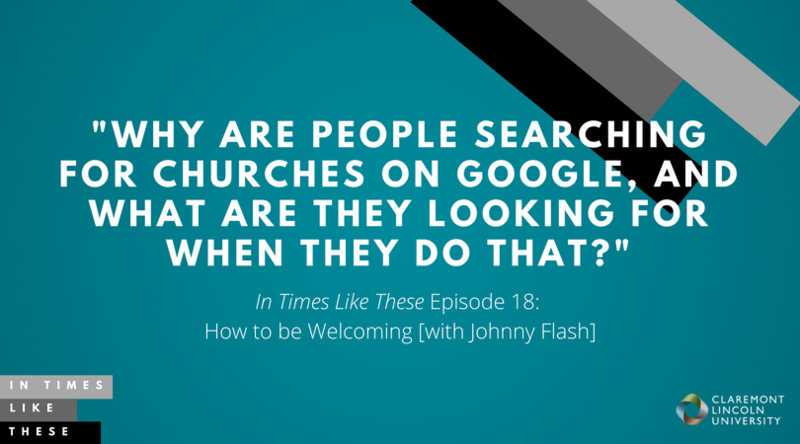 In this episode of In Times Like These, we talk with John Falk, also known as Johnny Flash. John is the creator of Amplified Impact, a blog, podcast, and organization that helps religious communities and organizations amplify their work to extend their message and purpose. Stephanie Varno: I love church. I love church. I’m one of these people, I will not miss church. I grew up going to church, Sunday morning, Sunday night, Wednesday night. I love everything about church. But when I try to find something like what time the Christmas Eve service is or where is the Pastor’s email, church websites, I think other than restaurant websites, are so clunky. Sometimes music loads. Sometimes like some kind of Listserv loads. I don’t understand why something that’s so important to so many of us, right? Like essential to our family’s life in a week, why the front public face of it isn’t as beautiful as all the other resources that we use? So tell me about your thinking on what that public face looks like for religious groups and churches. John Falk: Well, first let me just say thanks for having me on, Stephanie. It’s an honor to be on here and to get to chat with you. You know I wish your story about your church website or the restaurant websites that you’ve been to was like an anomaly, but unfortunately, far too often that’s exactly the case. Where I think churches sometimes fail to realize the front door of their church isn’t the front door anymore. John Falk: It’s usually their website and their social media channels. And so when churches aren’t having visitors, it’s usually because people have gone online and they either couldn’t find them or they weren’t impressed with what they saw. And then they decide to move on. Unfortunately, Google makes it so easy for you to just press the back button and click on the next church in the list, that there’s not a lot of grace there. And so I think churches are just…Obviously, some churches do this well, but I think a lot of churches are starting to awaken to the fact that their digital reputation and their digital presence, all of those things have a big influence on people’s decisions and whether they choose to engage with them or not. Stephanie Varno: So when did this happen? Because I feel like at a certain point in the United States at least, you move to a new town and if you were Episcopalian, you went to the Episcopal Church in town. And if you were First Baptist, you went to the First Baptist Church. And there wasn’t this sense of what do I personally need in a church. Or you went to the one closest to you, right? You went to the one within walking distance or driving distance. So what is this shift around I’m gonna get on Google and search for a church. And what are people looking for when they do that? Are they looking for an affinity with who they see themselves as? John Falk: And dropping off packages (LAUGHING). I’m sure people are appreciative of that with all the different holidays and birthdays and all of that kind of stuff. But I think there’s become this consumer mindset. Instead of kind of initially going to church for maybe different purposes, it’s become unfortunately a lot more of what can the church do for me, what can the church do for my kids, what can the church offer me. And I think some churches do a good job of moving people from consumers to more biblically based, I guess you can say, if we’re talking about a Christian church. But really I guess a lot of the religions would fall into this. Try to move people from kind of their self-serving purposes to kind of thinking about a higher being or God and those that are around them, kind of moving them from thinking about themselves to that. And so I think when it comes to people finding a new church, it tends to be more along the lines of is gonna work well for me, am I gonna fit in here. Theology is probably taking a backseat to the conveniences that the church has to offer. Stephanie Varno: Right. And in a way, I could bemoan that. But in a way, this is just a form of radical hospitality, right? Like I know that parents are busy, that we’re looking for good ethical robust youth programming, and if I find a church that maybe isn’t my denomination but has a great youth program and it’s easy to get to, I might start out going for self-serving purposes. I want community for my child. But the hospitality piece is the church leadership in that space, because I’ve come to the dinner party, now can be in relationship with me, right? Stephanie Varno: The idea is why would I create barriers to something that I think is really beautiful and life affirming. John Falk: They’re connecting with people that don’t ever even show up in the seats or it’s an alternative for when they can’t make it. So there’s definitely a lot of things happening now that couldn’t have happened 20 years ago. Stephanie Varno: I mean, I don’t know that we’ve gotten there. I’ve seen that in Japan, there are fewer and fewer ministers that can perform certain rights of passage at the end of life, because there are fewer trained ministers to do that, as fewer people are going into that. And so they actually have robots that do it. And they come around in the hospices and they’ll perform the last rites, which is really fascinating to think about. Is it the ritual? Is it the actual words and so it doesn’t matter that it’s a robot saying that to you or would you prefer to have someone who’s not of your religious tradition but who is human sitting there with you and doing it? And so, what is the value then of still having a building with seats that people come to synchronously? They come to at the same time in the same space. Why haven’t we found…I mean, I have a lot of communities on Twitter and on Reddit and on Weight Watchers, right? So why haven’t I given up coming to, it seems kind of archaic compared to everything else that we do online. John Falk: Yeah, there’s just some things that can’t really be, at least right now, can’t really be experienced online. And you watch a movie like Ready Player One or something like that, where it’s starts to kind of morph the in-person with the digital because there’s touch and feelings and other stuff that like aren’t really possible right now with the current way that stuff is digitally. So I think right now at least, and who knows what it’ll be like in another 20 years, but I think right now, there’s just some things that can’t be done digitally. Digital’s brought a lot of things together and created a lot of communities and ways to stay in contact, which is great, but I think there’s just some things that can’t be done digitally. And whether church and religion is one of those or not, probably only time will really tell what a church gathering 50 years from now will look like. Will it be everybody logging into their virtual projection room gathered together, singing the same song with the musician each playing at their house, all synced up together? I mean, who knows? You just don’t know. Stephanie Varno: Yeah, no. I will have to make a note in my diary some day to come back and look. 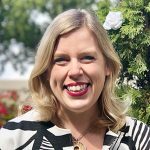 Stephanie Varno: So how did you get into this work? You clearly have a background in design and in communication, but also teaching and leadership. So how did this come about, the work that you’re doing right now for churches and communities? John Falk: Oh wow, I mean I think all of us have such unique stories that we end up with these different gift pairings that we didn’t even set out to kind of grow or facilitate and it just kind of happens. But I kind of grew up in the church and have always been involved and then went to do my undergrad. Then right out of my four year degree, got hired by a church full time to run their communications. It was a church of about 500 or so in weekend attendance and over the course of a decade, it grew to about 2,000, 2,500 in weekend attendance. And so had all of that experience, got a seminary degree along the way while working full time, and so I have a lot of church background. But also, because I was doing communications, a lot of it was design, graphics, websites, videos, managing teams of staff and volunteers that do all of those things. John Falk: And so I’ve always just had a passion for kind of the creative and…I think it was in college where I went to this large church and they just did really well. They presented the Gospel in a creative, compelling, kind of edgy way that I hadn’t really been exposed to before and I think that was kind of what lit some of the passions that were already in me, but just kind of didn’t see how to use them in an outlet. And so now I just full time, help churches and organizations try to reach their audiences. Some of those churches and nonprofits and some of those are businesses and restaurants and consulting companies and stuff like that. Announcer(steph: Being human is a messy endeavor. We are made to be in relationship and yet our fear of diversity keeps us apart. My new book explores this paralyzing paradox. Interfaith Grit, How Uncertainty Will Save Us is available now on Amazon and on my blog. It’s for all of us, ordinary readers seeking ways to learn how to engage with difference. Interfaith Grit is possible and it can save us. Stephanie Varno: Okay so, I’m thinking about a church growing at that rate. And so clearly the communications, like what I would see if I search online or if I’m downloading sermons or I’m seeing a Facebook Live, are going to be beautiful, easy to understand, easy to use. But if I go there in person, the people there also have to be embodying and practicing this radical hospitality. So help us understand, what are some key ingredients for communities that do this well? Help us visualize. We come into this space. What are going to notice, see and feel and hear that exemplifies this really radical hospitality? John Falk: Yeah, so I was talking about this the other day with my wife about hospitality and everything. Obviously, hospitality has to involve some kind of generous. You even look up the definition of hospitality and it says the friendly and generous reception and entertainment of guests, visitors, or strangers. You notice that word generous and friendly, hosting people, so I think it’s all kinds of things. It’s having open arms. It’s welcoming people in. Sometimes we have to live outside of the deadlines and outside of our agendas and outside of our efficiencies. It’s not all about my checklists and stuff. And we have to live outside of our sensibilities. Sometimes we just have to have a little bit of adventure, kind of live outside, color outside the lines a little bit. And so I think obviously hospitality looks like all different things for different organizations for different people. John Falk: I remember reading a story a while back in a book called Love Does by Bob Goff. And he tells this story, which is just so crazy, but it kind of exemplifies hospitality, I think. And that is Bob has this house that has a porch on the back of it and it backs up to a waterfront path. And there’s a guy walking by on the path. He sees Bob on his porch. So this guy decides to introduce himself to Bob. And this young man tells Bob a little bit about his story and says hey, I’m thinking about proposing to my girlfriend. I’m trying to find just the right spot to like ask her to marry me. Would it be possible to be able to use your back porch for my proposal? Stephanie Varno: Oh my goodness! John Falk: Yeah, I know. Just total stranger and Bob enthusiastically agrees. And so the young man, over the course of the next few days and weeks, returns several more times asking more favors of Bob. And so he says, can I have several of my friends serve us dinner on your porch? John Falk: Like after the dinner for you to take us out on the boat? And Bob’s like, yeah, that’d be awesome, let’s do it. And he keeps agreeing to all these things. But he doesn’t stop there. Bob calls the Coast Guard and asks them if they can show up with their fireboat and blast the sky with several streams of water for the grand finale while this couple is on the boat. Stephanie Varno: Oh my gosh! John Falk: And so I mean it’s this epic, crazy, like over the top story, but that’s radical hospitality, right? John Falk: This guy didn’t deserve it. He hadn’t earned it. John Falk: He wasn’t entitled to it. John Falk: All those things, but yet this was radical hospitality. So it’s like what does that look like in our churches, in our organizations, in our businesses? John Falk: And used it on Jesus’ feet. That was all she had and so that was extreme radical hospitality. But if a rich person had said, oh here’s one of my hundred bottles of perfume, like wash your own feet, or I’ll have my servant wash your feet or whatever, like that’s not the same hospitality even though the act is basically the same, right? Stephanie Varno: That’s right, that’s right. John Falk: So it’s in proportion to what someone has. And so you think about the story of the woman who didn’t have anything, welcomes Elijah into her house, offers the last bit of food that she has. Her and her kid are about die of starvation and she offers what she has kind of faith. That’s radial hospitality, right? That’s kind of giving all that you have. And so I think sometimes we get paralyzed by the great needs that there are. John Falk: We read the statistics. We read the statistics on homelessness or poverty or starvation or AIDS or pick your cause, right? John Falk: We just overwhelmed when we’re not necessarily called for us personally to help every one of those people. We’re just called to help who we can, right? John Falk: Andy Stanley says, I heard him give a message once and he said, do for one what you wish you could do for everyone. John Falk: And it’s the whole idea of you know what? If all of us did for one what we wish we could do for everyone, that would have a pretty huge impact. I mean, think about all of the people that would be impacted and obviously, some of us can do for more than one person what we wish we could do for everyone. But if we all just did one thing, just the ripple effect that that would have. So I think we can’t get paralyzed by the huge numbers or the small amount that we have. We just have to do what we can for who we can. Stephanie Varno: Right. No, that’s beautifully put. And you’re right about the paralysis. We think oh and so then we don’t do anything. Kind of despair, like the seduction of despair. Well, if I can’t, then I just won’t. But we can. John Falk: The expectations are suddenly wiped out. But then they walk into our house and my wife, she’s amazing. She’s an interior designer. She’s a designer. She just has a knack for hospitality, for creating spaces that are just warm and inviting. And people just come in and like somehow the charm of it all, the trees, the space outside, the friendliness, the welcoming place inside. It’s not perfect by any means, but it is just welcoming and inviting and people like to come. They like to stay long. They like to come back. And we crowd lots of people in our tiniest, smallest house, even though probably half the people there have larger houses or whatever. But we’re at our house and it’s because we open the door. We welcome people in and we just have that consistency of doing that, that it’s just a place that people wanna come to. And so, it doesn’t really matter what you have or what you think you don’t have. John Falk: Yeah, it’s like it doesn’t have to be perfect to be beautiful. Stephanie Varno: And they remember how they felt there, right? That’s the typical thing. Stephanie Varno: They remember how they were treated and how they felt and so they wanna get that feeling again. And we all have that experience, even just like in restaurants or museums or a hotel. It might not be the most cutting edge or biggest or luxurious, but if the people there went out of their way and you had an amazing experience, then you think wow, I felt good. I felt like they wanted…I experienced generosity. John Falk: Yeah, yeah. And I think time is one of our most valuable commodities, right? So it doesn’t have to be something physical or financial. Like just giving people time. I’ve got this neighbor. His name’s John also. John Jordan. And this guy is the most amazing, like he just gives of his time. Like you would think he has nothing else to do. He’ll be right in the middle of something and you go down and say hi to him and he just gives you the time of day. He gives you the shirt off his back. Even if you didn’t ask for anything or imply anything, he’s just there to help. I went the other day to like borrow a tool that I didn’t have that I needed for something I was trying to do in my wife’s garden. And I went there and just asked if I could borrow it and he was middle in the something. He stopped. He gave me the time. He asked how I was doing, all these different things. Stephanie Varno: That’s a huge one. Stephanie Varno: That feels really inspiring, but also doable. Because I have time. My 12-year-old son has time. We each have a little bit of time to give one or some thing, some creature, an animal [crosstalk 00:25:30]. Stephanie Varno: That’s a good one. That’s a really, really, good teachable takeaway. 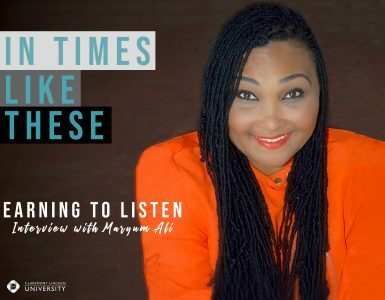 So the last question I have is about a lot of times when organizations or communities or even families are growing or changing, some of us feel a little bit of resistance or wistfulness or anxiety or that myth of scarcity comes up. And so I would imagine that even when a church is healthy or an organization is healthy and we’re excited about the growth. Like my university, we’re growing right now. Student enrollment is up and we’re all really excited about that. But as that happens, there must be some growing pains and some anxieties that individuals and the group as a whole have. Have you experienced that? And do we as leaders help shepherd ourselves through that? John Falk: Yeah, I think we all at some point or another and obviously some of us more than others, but I think we all sometimes resist change. We sometimes find change hard. And organizations are made up of people and so it doesn’t surprise me that we have these challenges in our organizations, in our churches, in our businesses. I think it’s particularly challenging for churches sometimes because they’ve been around so long, many churches have. They’re steeped in many traditions and although traditions can be beautiful and they can be good things, they can also sometimes get in the way of progress and kind of change. They can hinder us from moving forward, because we don’t wanna cancel the program that only eight people that have been at the church forever participate in because we’re afraid we’re gonna hurt their feelings. 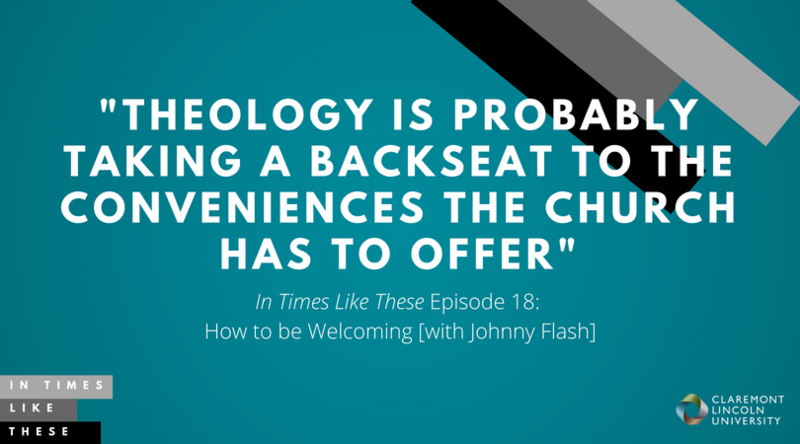 John Falk: And I think the churches that get it, I think it is because people move from that consumer mindset to how can I serve others. And so you start to have a church that has older people in it that aren’t so focused on the music being their favorite taste of music, the programs being the programs that they want. And they’re thinking about how can I make this a place that my kids and my grandkids and my great-grandkids will come and want to know Jesus. And so they kind of move beyond thinking about themselves and thinking about what kind of legacy am I leaving? How am I going to influence the next generation and the generation after that? And it’s those churches where you find multigenerational and you find an older demographic that isn’t so much there because it’s their favorite music or because it’s done the way that it’s always been done or anything like that. It’s because they see the life change happening and they wanna be a part of that and they wanna help facilitate that and love the next generation and serve them in that way with this radical hospitality that we’re talking about. John Falk: And so I think when people start to do that, that’s when things really start to change. And I think sometimes we have to be positive. When we have those people who are resistant to change in our organizations, we have to not be perceived as the negative one in the relationship. We have to turn it around and be positive. We can’t dismiss all of the traditions that they’ve had, all the things that have been good, all those things that have had their time, their purpose, that have done great things, we have to be positive. And I think when we can help them see the bigger picture of what we’re trying to do, what we feel like and sometimes it might be God calling us, to feel like God’s put something on our heart or called us to do something or whatever, that when they can get a sense of that vision, then I think that can start to change things. Stephanie Varno: I was expecting a very clinical kind of recommendation. But you turned it around and what you basically, what I heard you say was how would I treat someone in my house, right? If they wanna take off their shoes, I’m happy that they’re there. I’ll take my shoes off. If they love my chocolate pie so much that I’m not gonna get a piece this time, I’m thrilled that they love my pie. I’m happy. Stephanie Varno: But once you move from, even something like that, that actually physically manifests. If I think about it in terms of how I would treat someone in my home that I love and I’m thrilled they’re there, I don’t care so much. Yeah, sit in the window seat. Yeah, use the tea glass for Pepsi. I don’t care. I’m happy you’re here. [crosstalk 00:31:12]. John Falk: Well and I think the disconnect is that most churches, I was consulting with a church just yesterday on a call and was looking at their website. And it was a good looking website. It had good imagery, good wording, and I think the tagline was something like Real God and Real People or something like that on the homepage. And I was struck because as I went through the website, I didn’t see any stories of real people. Like they just weren’t there and there was this kind of disconnect where it was like, hey your messaging is good. Your visuals are good. But there’s a little bit of a disconnect in that you say Real God and Real People and I haven’t met one real person on the site. In the sense of, hi I’m John and this is my wife, Julie and we’ve been coming to the church for three years and this is what it’s done in my kids’ lives, blah, blah, blah. Not that you just wanna have the overtly testimonial, but people care about what other people say and so you have to kind of have that consistency from digital to in-person. All of those things have to kind of work together. John Falk: Yeah and if you wore a suit in your own home and invited me over for a casual dinner, I’m gonna feel like I showed up at the wrong house or you really didn’t mean to invite me or there was some kind of miscommunication. Because you and your family or whoever is all dressed up in a suit and I show up in my casual clothes thinking we’re having dinner and now all of a sudden, there’s a disconnect between who I thought you were or what I was being invited into versus what I’m actually being invited into. And there’s nothing wrong with dressing up. That’s not the point here. Stephanie Varno: Right, no, no, no. It’s the disconnect. John Falk: But it’s the welcoming people in. Stephanie Varno: Oh, I love this. I actually feel both inspired and also this is something I can do, right? I personally can have an impact in a big organization or in a church or in a movement because it’s not…I guess before I started talking to you, I thought it was like a systems approach. Like I had to have a background in organizational leadership. But what we’re talking about is actually Stephanie being Stephanie in a way that I would be on an individual level. But doing that as part of a community. John Falk: It’s been clean, but it’s not smelling clean. John Falk: And stays (LAUGHING) in this same Airbnb. But it just shows that that extreme hospitality gives grace to the imperfections. John Falk: And I think that’s maybe why even our house works, right? It’s not that it’s perfect or anything like that, but when you kind of go above and beyond with the hospitality, the things about it being crowded or some people having to sit on some chairs or this or that, they kind of get overlooked because of the hospitality. Stephanie Varno: Right, the generous of spirit, which is part of that definition. I love how you have that definition like at the tip of your tongue. But it’s the generous of spirit that makes us feel good and cared for and a little joyful. Like wow, she went out of her way and that really good feeling is like a light that permeates the whole experience. John Falk: Yeah and you just never know the impact that it’s gonna have on people. Stephanie Varno: Right. Oh my goodness, thank you so much! I learned a ton and I can’t wait to share this. I feel more capable and less paralyzed already. John Falk: Well, thank you so much for having me. It’s been an honor to be on here. Announcer(steph: Thanks for listening to In Times Like These, where we explore issues of politics and faith and learn from one another how to navigate difference for maximum flourishing. In Times Like These is a product of CLU Live at Claremont Lincoln University. For more, subscribe, share, and visit us at claremontlincoln.edu. 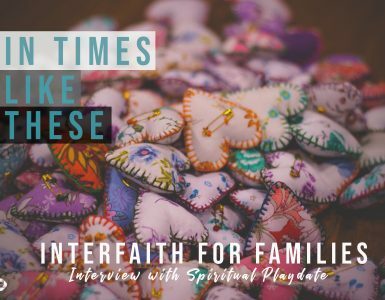 Families today have many demands on their time, and are looking for different kinds of resources and supports from religious and ethical communities today. People will ask, “What can the church do for me? What can the church do for my kids? 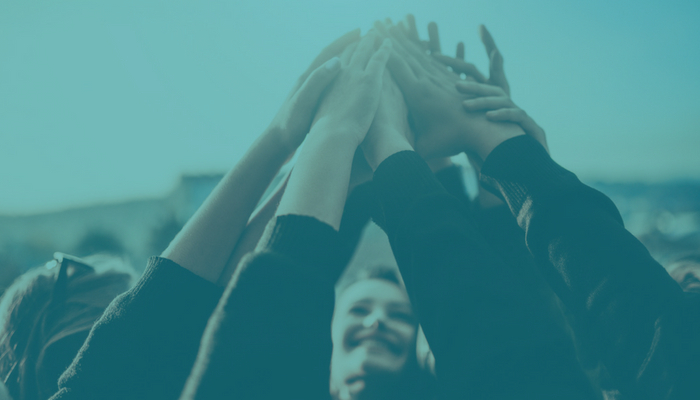 What can the church offer me?” This “consumer mindset” can feel uncomfortable for traditional religious leaders, but if church does its job, then people will feel connected, they will feel welcome, and then they will become part of community. When we think about taking care of others—whether it be our neighbor, strangers, visitors, or newcomers—we need to remember that real generosity has to do with what we have. If we live in a little house, and open it to the entire Little League team, that’s radical. If we have a giant synagogue, and only allow one group to use it a week—that’s not so generous. When you think about what you have to offer, offer it with your whole heart and don’t worry about how fancy or large it is, just look to meet the need of those you can. Social media and online conveniences are part of our lives. We can find music or courses on any topic under the sun within minutes, and get many goods and services delivered to our homes within a day. We are used to finding information about food, travel, religious, the law and politics, healthcare, parenting, mental health, taxes, and consumer issues on our smartphones and without leaving the comfort of our homes. Of course we use Google to find religious and ethical communities that suit our needs. For religious, interfaith, and ethical organizations, leaders need to stop seeing a web presence as an “extra” and realize it is the front door to their community. Claremont Lincoln University offers socially conscious master’s degree programs in organizational development, public administration, human resources management, healthcare administration, educational leadership, and social change.